Release price guide: Suns and rainbow on label Barclay with catalogue numnber 930016 - 930019, France. Jimi Hendrix Record Value Release price guide: Suns and rainbow on label Barclay with catalogue numnber 930016 - 930019, France. Suns and rainbow is the collectable edition of title Are you experiencedAxis: bold as loveElectric ladyland recorded by Jimi Hendrix Experience. The record was published with catalogue number Barclay 930016 - 930019. This pressing was released in France. This record was release on 1970-00-00. It was released as a collection-box and appeared on the Barclay record label. The sleeve cover was designed by an unknown artist. Our auction results for 930016 - 930019 were last updated on 2019-04-13. Out of 2 auctions 2 items were sold. The best auction result was $91.67 On average $74.34 was the price paid for this record. Four LP Box containing the three albums Jimi Hendrix recorded during his lifetime. 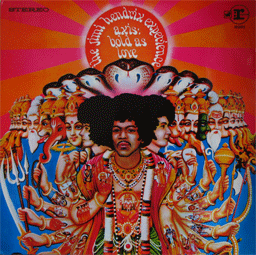 - Are You Experienced - Axis: Bold As Love - Electric Ladyland Together with eight-page booklet. The box contains the famous French Barclay mono pressing of Are You Experienced (considered by certain people superior to the UK Track pressing). The other records are classic stereo but still on the Barclay label. JIMI HENDRIX French Barclay 4-LP BOX SET w/BOOKLET Superb! JIMI HENDRIX French Barclay 4-LP BOX SET Superb!